In this study, we show that the exposure of European firms across European capital markets is associated with significant constraints in financial reporting discretion. 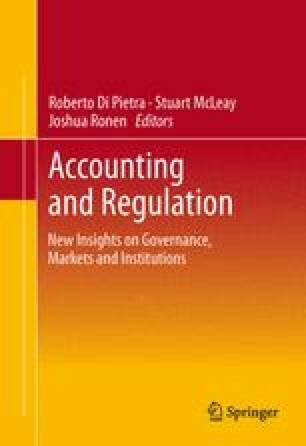 By exploiting the variation in the regulatory environment in this setting, we are able to demonstrate that incentives for reducing financial reporting discretion stem from a form of legal bonding within Europe, in the sense of the exposure to at least one capital market with better regulation than the firm’s origin. Furthermore, we provide evidence for the presence of reputational bonding in cases where the firm is exposed to capital markets with weaker regulation than the regulation in its home jurisdiction. We corroborate the evidence on reputational bonding by extending this investigation to circumstances that are likely to trigger managers’ engagement with more transparency even in the absence of strong legal regulations, such as stock exchange consolidation and geographical proximity. Brüggemann, U., Daske, H., Homburg, C. & Pope P. (2012). How do individual investors react to global IFRS adoption? Working paper, available at http://ssrn.com/abstract=1458944.